In this episode, I interview Andrew Warner. When Andrew was younger, he built a company to $30 million in annual sales. Today, Andrew is the founder of Mixergy, a site and podcast focused on tech startups. Andrew’s newest venture is called Bot Academy, a site focused on chatbots. Andrew explains the many advantages chatbots offer compared to email. You’ll discover how tags and the right content can create interactive and engaging chatbot conversations. Chatbots: Marketing Automation via Messenger featuring insights from Andrew Warner on the Social Media Marketing Podcast. Since 2008, Andrew has been running Mixergy, a podcast and website focused on helping newer tech entrepreneurs learn from a variety of experienced tech entrepreneurs and exploring topics like their backgrounds, how they built their businesses, and why those businesses worked. Andrew has run Mixergy since 2008. Although Andrew had made angel investments in chatbot software companies, he didn’t really use them in his work until his company had a problem with its email open and click-through rates. A big part of Mixergy’s business is growing their email list for relationship-building with future customers. To improve those rates, Andrew tried many things including adjusting their funnel, but nothing worked. Then Andrew realized he was complaining to his team about the problem not with email, but via chat apps such as Facebook Messenger, iMessage, and Slack. Although Andrew was communicating with people he loved and worked with using chat, he was using email to communicate with prospective customers. He began to question whether email was the issue. Andrew decided to test how communicating with customers via chat would impact the metrics for his business communications. When they communicated with customers via chat, open rates rose from 20% to 30% with emails to 80% to 95% on Facebook Messenger. Click rates rose from 5% on email to more than 50% on Messenger. Andrew recalls driving from San Francisco to Napa to get away from work for the day. Two different people called him during the drive and said, “Please show me how you’re reaching people on Facebook Messenger.” That’s when Andrew realized chatbots were the future and he could build a business based on chat. The first company Andrew invested in was Assist, founded by his friend Shane Mac and the founder of Geek Squad, Robert Stephens. One of their tests was this chatbot that at first worked on SMS text messages and then Facebook Messenger. They were so plugged in that when Facebook was thinking about chatbots, the duo went to Facebook’s offices to talk about it. Andrew started Bot Academy to help others reach users through Messenger. Then when Mark Zuckerberg announced chatbots at F8 2016, Andrew asked himself, “Why am I not paying more attention to what Shane and Robert Stevens are telling me?” That’s when he started to get really lit up by the idea of chatbots. Listen to the show to hear about other efforts that didn’t help Andrew improve metrics for his email list. Chatbots can provide a sense of immediacy that email doesn’t. Marketers can use this immediacy to share timely reminders and links. For example, someone who registers for one of Andrew’s webinars receives the message, “Press this button and my chatbot will remind you on Facebook Messenger.” When it’s time for the webinar, the chatbot reminder makes the recipient’s phone vibrate and provides a link that leads directly to the webinar. Like email, chatbots allow you to tag customers so the bot can deliver customized responses. Andrew will ask his audience a question like, “How big is your business?” or “Are you interested in buying this?” He sets up the bot to tag customers based on their answers and the tags allow the bot to deliver customized follow-up messages. For instance, he doesn’t want to sell to people who don’t have a business or to anyone who told him they don’t want to buy. You can also deliver your product within the app. For example, if someone wants to watch a Mixergy video, the video can play right in Facebook Messenger. This capability is different from email, which requires someone to click to another page. Similarly, someone can also buy a product right in Facebook Messenger. A customer simply clicks a button to purchase, making the process quick and personalized. There’s a variety of file types you can send via chat. You can send images, videos, PDFs, and more. Facebook Messenger makes interaction with customers personal for marketers, too. With Facebook Messenger, a person who subscribes to your offer shares their real name (whereas people may not use their real name with their email account). You can see their face and even click to see their Facebook page to learn more about them (where they went to school, where they live). If the recipient clicks yes, Andrew’s follow-up message might say, “Look at this building. It’s about to be destroyed. Why is this building going to be destroyed? Well, the answer has to do with what’s going to happen with your business. Can I tell you what it is?” The recipient then needs to click a button to get the next message. This approach is interactive, but your audience doesn’t have to put a whole lot of effort into it. With each click of the button (engagement), the user gets another image, GIF, or maybe a short video. If you want to deliver more content (like a report), you can also send a PDF. The types of files available in chat are increasing. Length of the video depends on the time needed to present the material. Generally speaking, Andrew tries to keep all of the text and images short, because in a chat app like Facebook Messenger, people don’t expect to watch videos. It’s important to share content people can watch or see within Facebook Messenger. You don’t want people to visit another page or website to see the content. Listen to the show to hear my thoughts about which aspect of chatbots is most important to marketers. Everything a customer does within your chatbot experience should be tagged. If they click on multiple messages, tag it to know they’ve been opened. Andrew is a fan of frequently asking questions like “How big is your business?”, and then giving options such as “0 to 10 employees,” “10 to 100 employees,” and so on. You can then tag people’s answers. You can also tag where they came from and what they wanted when they arrived. Those who click the link Andrew shares at the end of this podcast will be tagged as listeners. Although much of the tagging is automated, more humans are being added to the chat experience. For example, if you go to Andrew’s site after hearing him on this podcast (via a link he shares at the end of the interview), you’ll be tagged as such. He might ask a couple of questions and tag you based on your answers. A year from now, if you reach out, Andrew’s team will see the tags, be able to understand who you are, and direct you to someone who can offer a more personalized answer. So another benefit to tagging in chatbots is that you develop a long-term view of a customer based on all of these tags. In the future, data about a customer’s email and chat interactions will be available through a system similar to customer relationship management (CRM). Listen to the show to hear Andrew and I discuss what a CRM-style integration between email and chat might look like. Because Andrew is an angel investor in ManyChat, I ask how Facebook and ManyChat work together to create chatbots. He says Facebook is doing a lot more of the work than they realized. Andrew gets people into his funnel by offering a free report. If the person clicks, their Facebook Messenger chat app or a chat bubble on Facebook.com opens. Then the bot will say, “Can I send you the report right now, right here?” If they click yes, the PDF comes in through Facebook, not ManyChat. ManyChat tags where the people who got the PDF came from and that they downloaded it properly. After those tags are saved, ManyChat also enables you to send a follow-up message to everyone who got the PDF. Also, if Andrew is back on this podcast a year from now, he’ll ask ManyChat who subscribed to his chatbot last time he was on the show. That way, he can send a message telling them he’ll be on again, along with a link to subscribe and listen. That’s the kind of thing that ManyChat will do. Next, I ask Andrew what happens if Messenger is no longer free. Andrew says Facebook has been planning to charge for the delivery of messages from the beginning. He hopes they do because hardly anyone is creating chatbots, recruiting subscribers, and learning what kind of messages work. If Facebook starts to charge, people who are new to chatbots will have a huge barrier to entry both in the price they have to pay and in the learning curve. So Facebook charging for message delivery will reduce competition. Anyone who has been creating chatbots is getting experience with the process and will have an advantage. Keep in mind that Facebook doesn’t want you selling to people who are subscribed to your bot unless they’ve engaged with you within the last 24 hours. For example, if you decide to send out a discount every day to your audience, kind of like Groupon did, people will buy. Your open rates, click rates, and purchases will be higher. You’ll be able to run with this for a while, but at some point, Facebook will catch onto you and shut you down. Facebook wants this to be a platform on which you build your business. So only sell to people who’ve interacted with your bot in the last 24 hours. Stay on top of this because Facebook might change it to 12 hours. They don’t want users being bothered by aggressive, pushy salespeople. Listen to the show to discover my thoughts on why and how Facebook will prevent Messenger from becoming a marketing haven. To explain how you might provide something valuable and then send a timely followup in a chatbot, Andrew shares the waitress technique. You go to a restaurant, have a good meal, and then towards the end, the waitress asks if she can show you the dessert menu. You either say yes and choose a dessert or no and move on. She doesn’t say, “Hey, can I sell you some dessert right now?” You need to do the same thing in Facebook Messenger. Ask a question that draws people to look at what you have to sell. Ask questions that lead people to your product or service. If a recipient says yes, he might come back and say, “This thing that you said you were interested in, we have for sale.” He might even ask a question beforehand like, “Would you be interested in running sandals? Or are these too weird for you?” Whether the recipient says, “Yes, I’m interested” or “Too weird,” he’ll tag them. He’s not going to sell to anyone who says, “Too weird,” and can come back to anyone who’s interested with an offer. Listen to the show to hear the complete waitress technique dialog. To move people into your bot, have a link to a freebie for new subscribers. For instance, the person who created the running sandals might say, “Are you interested in learning how to increase your speed and decrease your backaches? I’ve got a free report.” Show a picture of your freebie, too. When someone clicks the link, it automatically opens Facebook Messenger on their phone or Facebook desktop. The chatbot again shows a picture and says, “Can I give you the report right now? And use this chat window to stay in touch with you?” When the person clicks the button saying “Yes, I do want it,” you give them the PDF in Messenger. Offer a freebie to get people to subscribe to your chatbot. The software knows to come back every day, every week, or every few days and teach them more about how they should be running, back pain, why lighter shoes are better, for example. Over time, you sell. It’s not a hard sell, but a soft sell, because that’s the medium. Another way to get people into your bot funnel is through comments on a Facebook post. For example, on your business’s Facebook page, post an image of your guide and say, “If you want this guide, just comment and I’ll send it to you via Facebook Messenger.” The bot watches for comments and sends out the guide instantly as soon as someone comments. When you use this approach, the messaging in your Facebook post has to say that a bot will respond. You can also move people into your bot funnel via a landing page. As Andrew previously mentioned, when someone registers for one of his webinars, the registration process asks whether people want to receive a reminder about the webinar via Facebook Messenger. About 75% of people who register will ask to be reminded. On the Mixergy site, Andrew has been testing a feature that displays a little box after someone has been on the site for a while. The box asks, “Can I show you this cool new thing I’ve been doing on Facebook?” The box also displays a user’s face from their Facebook profile. The idea is that the personalization of the box increases the website visitor’s trust and identification with the site. To accept the offer, all the visitor has to do is click a button. The visitor is then instantly subscribed to the bot and the bot delivers the offer. The ease makes the opt-in rate pretty high compared to alternatives like opting in via email. 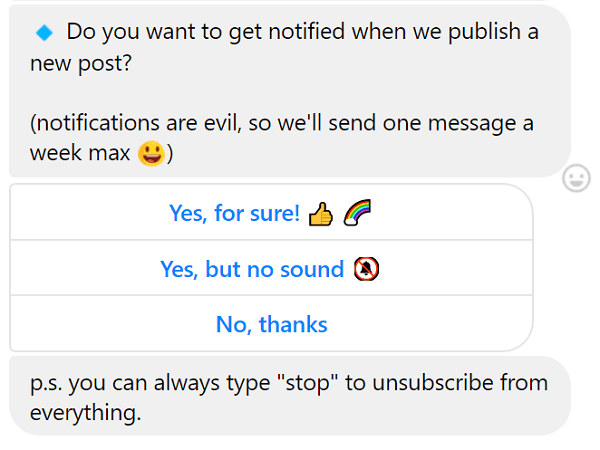 Type “stop” or manage messages to stop communication with a chatbot. Although people may fear they could get too many messages in Facebook Messenger, Facebook has made unsubscribing very easy. With the chat management options, you can click to either stop getting messages from a sender or report them. If a page gets enough reports, they’ll lose access to Facebook Messenger. Although typing “stop” works for many bots, using the manage messages feature gives the user more power. Next, Andrew shares how to set up a sequence of messages. First, make them as personal as possible. Andrew begins with a picture of himself and says, “Hi. Can I give you this thing I promised you? And use this chat window to stay in touch with you?” He explicitly asks for permission to stay in touch. Although Facebook might not require this permission, Andrew asks anyway because he wants the person’s permission. Next, Andrew gives the thing he promised and says what’s coming up tomorrow. The first thing is quick and easy and comes with a promise to come back the next day with another useful message. He’s found that setting people’s expectations and teaching people the platform leads to more engagement. Andrew tells users when to expect their next message via chatbot. In chatbots, how-to content is really helpful. If you’re going to drip content, teach as much as possible. Find out where your audience is right now, where they want to go, and what steps will get them there. Each one of those steps is another day’s worth of messages. That’s the ideal. I ask how frequently marketers should communicate via chatbot. Andrew says the right frequency varies based on your audience. Pick software that shows your open rates. If your open rates start to drop, then you need to send fewer messages and make them more interesting. The first message should come in instantly. The second one needs to come in the next day. After that, try to pace it at no more than once a day and at least once a week. Listen to the show to hear Andrew explain why difficulty unsubscribing from email lists might make chatbots more appealing. For example, via a desktop browser, you can upload your podcast audio and select clips from that audio file to upload to your Anchor station. Then the video feature in the Anchor mobile app can transcribe and animate the audio for you. For the animation, you can choose from a few preset color schemes, and you can review and edit the transcription anytime. Each clip is limited to five minutes. Anchor has a new feature that creates animated transcripts from your audio. Note: The Anchor app was updated on September 25, 2017. These notes reflect the features available at the time of the update. Listen to the show to learn more and let us know how Anchor Video works for you. What do you think? What are your thoughts on chatbots? Please leave your comments below.